There are a number of legendary romantic places around the world made famous in movies, novels and songs. Tropical islands. The top of the Empire State Building. Pretty much anything to do with Paris. What about the Wasatch Front? Have no fear. While taking a trans-Atlantic flight can definitely help in the romance department, you can also connect with your Valentine at plenty of local escapes that offer what any couple really needs: time alone together. Consider these options, which can be used next week for Valentine’s Day or any time you want—or desperately need—some passion. Those looking to add a little urban spice to their relationship in chic surroundings will want to try the Hotel Monaco (15 W. 200 South, 801-595-0000, Monaco-SaltLakeCity.com, rooms start at $139 per night), which bills itself as downtown Salt Lake City’s “guilty pleasure.” The hotel—located in the historic Continental Bank Building—has an eclectic, yet sophisticated, feel and recently underwent a $5 million renovation on the interior. You can check out the updated look when you try one of the hotel’s romance packages. The Wine Me, Dine Me package ($344) comes with a bottle of champagne and a $50 credit for fine dining at the hotel’s Bambara Restaurant. The Don’t Come A-Knockin’ ($309) offer includes fuzzy handcuffs, an “intimacy kit” and a 2 p.m. checkout. There’s also the Gay Power Package ($304), which includes a “playful bedroom game,” vodka, 5-Hour energy drinks and a 2 p.m. checkout. Gay, straight or bi, who doesn’t want that? Those who would like to take a journey far away from the everyday can head 90 minutes north to Logan’s Anniversary Inn (169 E. Center St., 435-752-3443, AnniversaryInn.com, rooms start at $119, Valentine’s Day week rates are listed), which has 33 themed suites that can let the two of you feel like you’ve left the world behind. Two of the suites with a particularly romantic angle are Juliet’s Balcony ($299), which has two stories and a balcony so you can re-enact the famous scene, as well as a jetted tub for two. There’s also Aphrodite’s Court ($139), an entire suite dedicated to the Greek goddess of love. 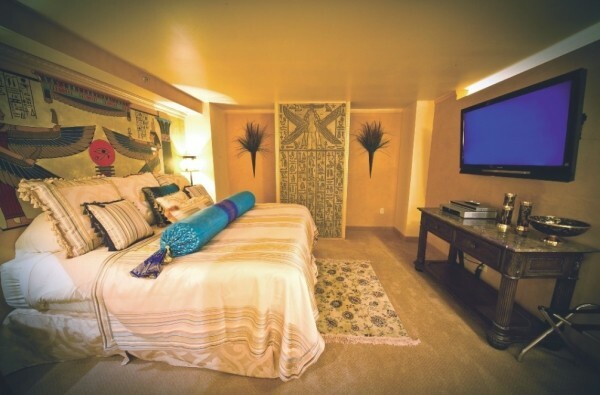 Of course, you and your mate might have the type of relationship where you want to try Jesse James’ Hideout ($299) or the Lost in Space ($139) suite instead. Go ahead and enjoy yourself. We’re not here to judge. How about a getaway where you can hibernate in a secluded cottage in the mountains, only emerging to eat gourmet food? Check in to one of the cottages or cabins at Sundance Resort (8841 N. Alpine Loop Road, 855-750-8900, SundanceResort.com, rooms start at $299) in Provo Canyon and try the Table for Two package ($449-$569 per night), which comes with a night’s stay and two great meals. Dinner is at the famous Tree Room where you dine on pan-seared European turbot with potato chive gnocchi, or pepper steak with buttermilk mashed potatoes. You’ll quickly learn why the Tree Room has received accolades from Wine Spectator. In the morning, have breakfast in the Foundry Grill, where you can try smoked Utah trout with eggs Benedict on top. For nature lovers, what’s more romantic than a looking up at the stars on a moonlit night? Looking up from the secluded Big Water Yurt ($75 per night, 801-483-5473, Recreation.SLCO.org/parks), located in Millcreek Canyon. Outdoor enthusiasts will enjoy cross-country skiing up to the 20-foot diameter structure, which is equipped with sleeping accommodations and a wood-burning stove. It’s so popular, you’ll have to plan ahead to enter a lottery to draw a night. Waldorf Astoria is one of the most respected brand names in hotels, and Utah is lucky enough to have one. Waldorf Astoria Park City (2100 Frostwood Drive, 435-647-5500, ParkCityWaldorfAstoria.com, rooms start at $469) has a Romantic Getaway package ($869 per night, two nights required) that includes a rose-petal turndown for your room. You can also take advantage of a ski lift to Canyons Resort located just outside the front door, but considering you’ll have a $50 breakfast-in-bed credit every morning of your stay, why would you leave the room? Perhaps you can drag yourself out of bed to enjoy a couples’ massage at the luxurious Golden Door Spa, which is included in the package. You’ll be so pampered from the moment you step in the front door, you may never want to leave. When it comes to romance, the old saying “If you’re bored, then you’re boring” definitely applies around here for Valentine’s Day. There are plenty of places nearby for a passionate getaway where you can appreciate your favorite Valentine—on Feb. 14 or any other day. Kathleen Curry and Geoff Griffin blog as the Travel Tramps on CityWeekly.net and host the weekly Travel Brigade Radio Show. Follow them on Twitter @TravelBrigade.